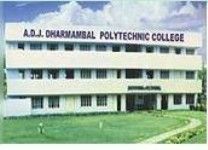 A.D.J Dharmambal Women's polytechnic is a Government aided Institution which was started under the auspices of the A.D.J. Dharmambal Educational Trust and is running efficiently under the continuous guidance, encouragement and support from the management. Our founder president the late Thiru.A.D.Jeyaveera Pandian was a great philanthro-pist, Industrialist and a pioneer in the Import and Export business. He showed great interest in the growth and development of the polytechnic.